WASHINGTON — America's top diplomat stepped back Friday from his offer of unconditional talks with North Korea, telling world powers the nuclear-armed nation must earn the right to negotiate with the United States. The debate over offering North Korea unconditional talks reflects the differences within the Trump administration as it runs out of time to prevent North Korea from perfecting a nuclear-tipped missile that can strike the U.S. mainland. President Donald Trump hasvowed to prevent such capability, with military action if necessary. So far, U.S.-led sanctions on North Korea and diplomatic isolation haven't compelled Kim Jong Un's government to stop its nuclear and missile tests, or to seek negotiations. "Well, we're going to see what happens with North Korea. We have a lot of support. There are a lot of nations that agree with us — almost everybody," Trump told reporters. He credited China — which accounts for about 90 percent of North Korea's external trade — with helping on pressuring North Korea, while Russia was not. On the issue of starting talks with North Korea, Tillerson's tone was significantly different from three days earlier. The White House quickly distanced itself from Tillerson's remarks. On Wednesday, a National Security Council spokesperson said North Korea must not only first refrain from provocations but take "sincere and meaningful actions toward denuclearization" for talks to happen. The spokesperson, who was not authorized to be quoted by name and requested anonymity, said that given North Korea's most recent missile test, now was not the time for talks. "They know where the door is. They know where to walk through that door when they want to talk," he told reporters. North Korea's U.N. ambassador, Ja Song Nam, did not mention the possibility of talks with the U.S. in his very rare appearance before the Security Council on Friday. He said its possession of nuclear weapons was self-defense against "U.S. nuclear threat and blackmail." 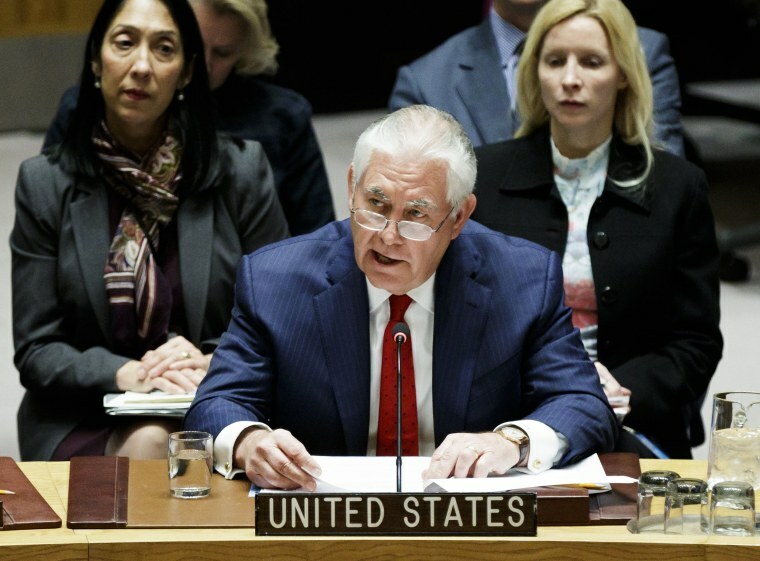 Tillerson called on China and Russia to go beyond U.N.-mandated economic sanctions imposed on North Korea over its nuclear and missile tests. He said North Korean laborers were toiling in "slave-like conditions" in Russia for wages used to fund nuclear weapons, while China was still allowing crude oil to flow into North Korean refineries. Russia's U.N. ambassador, Vassily Nebenzia, said North Korean workers in Russia were guaranteed their rights, and he questioned U.S. commitment to a peaceful resolution of the crisis. China's deputy U.N. ambassador, Wu Haitao, called for early resumption of dialogue, saying "the parties concerned should move towards each other" instead of directing blame. North Korea has conducted more than 20 ballistic missile tests during 2017 and its most powerful nuclear explosion to date. Its more recent missile test in late November fired a projectile that experts say could carry a nuclear warhead to the U.S. Eastern Seaboard.